While his sophomore season didn't end as Jamar Marshall (pictured) would have hoped, the numbers below indicate a bright future isn't too far away. 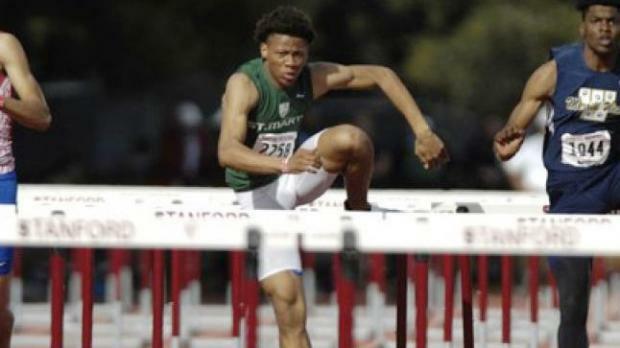 Hurdles in CA in 2018 was truly survival of the fittest. Left standing at the end was senior Jaden Ellis in the 110 hurdles and junior Caleb Roberson in the 300 hurdles. Those were the State Meet champions. Note that these rankings are strictly for combination hurdlers. Single-event hurdlers are not included. Sophomore Caleb Foster is one of the state's best 110 hurdlers (Central Section champion and State Meet finalist) but because he doesn't have a clocking in the 300s, he's not listed below. These rankings are based on the first category, in this case 110H. That's why Roberson and his 36.61 from State are down the list. Sondre Guttormsen is the CA and State Meet record-holder in the pole vault who placed 2nd at State in the 110H. He only ran the 300s three times. Aiden Jackman appeared as a strong candidate to double at State until an injury derailed his senior season.